One of the things that you need to consider when picking the best men’s razor for you is if you should go for a safety razor or straight razor. 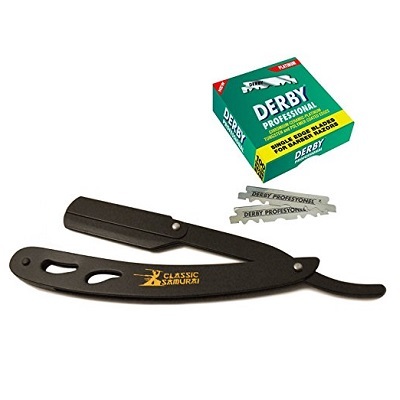 Straight razors provide excellent cutting capability and are much more durable than their counterparts. However, safety razors are easier and to use, which is why we recommend them to beginners. In this top, we listed both straight razors and safety razors, so you can compare these products side by side. In the end, it is up to you to decide which is the best razor for you. The Diamond Edge series made this list due to its convenient pricing, 100% stainless steel blade, and 5 double edge blades summing up to 10 replacement blades. As far as its cutting capability goes, customers report the blades are sharp and provide a clean and sharp look. However, most users report this is meant for experienced shavers as it feels a bit stiff and can easily cut the skin. 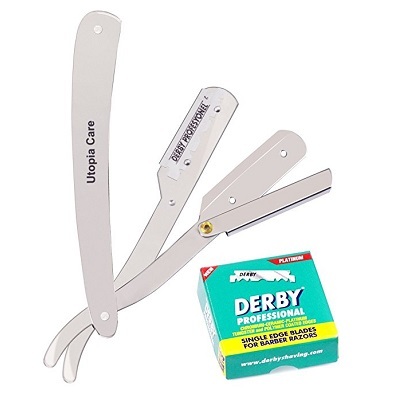 This straight razor by Utopia Care is made out of brass and has a chrome plating and comes with 100 individually-wrapped replacement blades which help you save in the long run. 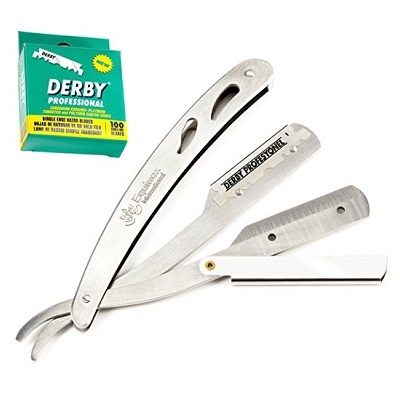 Reviews from verified customers mention this straight razor has a great price/quality ratio and is easier to use. In fact, many customers concluded this is the best men’s razor for those who believe paying $20 for 2-3 disposable razors is a waste of money. The Samurai CS-102 is made of surgical quality stainless-steel blades which provide superior cutting power and durability. It features an elegant matte finish and comes with handy plastic storage pouch to further protect the shaver. As far as replacement blades go, the unit includes 100 of them. Customers who used this product loved the small lever that tightly closes down and locks, securing the blade in place. Other appreciated features of this blade were its weight that adds to the maneuverability, and the smooth, quiet shave it offers. The Equinox straight edge is made from stainless steel and comes with 100 replacement blades. 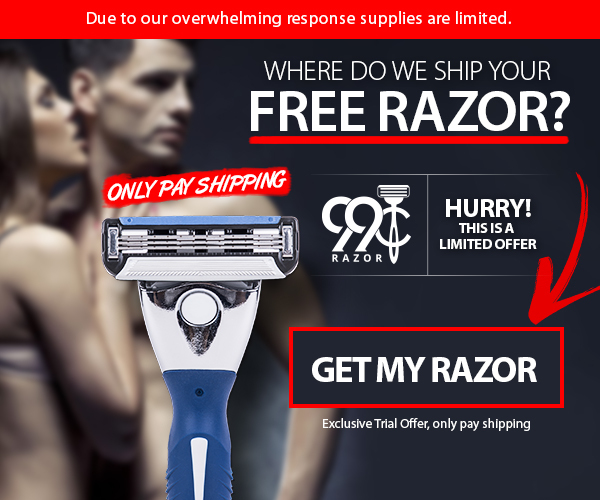 The razor itself has the perfect weight for maximum maneuverability according to the manufacturer, and reviews from verified customers confirm this. The handle is ergonomically designed and fits comfortably in either the left or right hand. 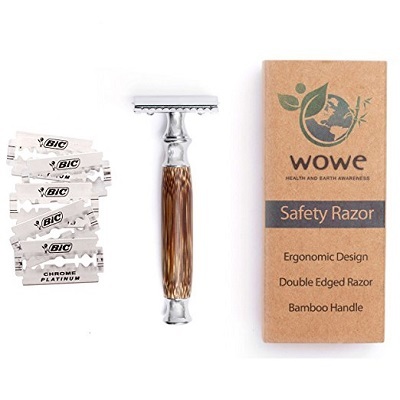 It also comes with a money back guarantee by the manufacturer, which is highly convenient for beginners who are not sure whether this is the right shaving tool and method for them. 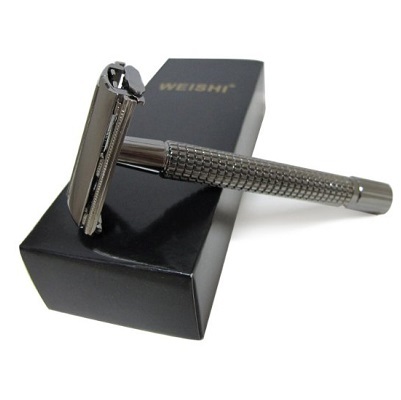 The WEISHI safety razor features a long handle design and sturdy construction and comes with five Ying Ji Li blades. The manufacturer takes great pride in using both advanced technical innovation and traditional craftsmanship to make these. In terms of comfort, the ergonomically designed has a non-slip coating for added security and control. In addition, the blades are extremely sharp and are suitable for all hair types. Even though it ranks on the 3rd spot in the Safety Razors section, we think it’s the best men’s safety razor for beginners. 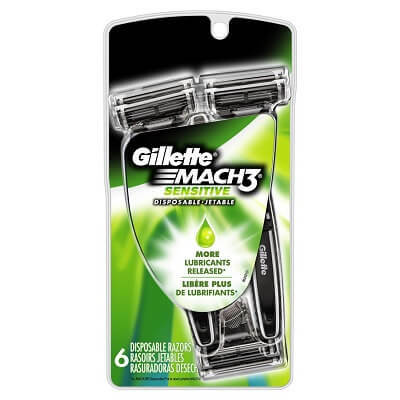 The Gillette Mach3 comes with 3 progressively aligned blades which take out more hair during a stroke, thus requiring less strokes and reducing irritation. Its blades have a diamond-like coating which increases their strength and sharpness. The improved strip of lubricant provides a smooth glide and the soft microfins lightly stretch out the skin to avoid cuts and provide a smooth finish. Online reviews from verified customers confirm the quality and longevity of these blades, as well as its smooth results. The Parker 96R has an easy to use twist to open blade replacement system which, according to online reviews, makes it the best men’s razor for beginners. This safety razor has a brass frame and a textured handle for added grip and maneuverability. The unit uses Shark Super Chrome blades and comes with five in the initial package. These blades provide a very close shave and are coated to prevent damage from rust and oxidation. Reviews also mention this is a great tool for those with thick beards. 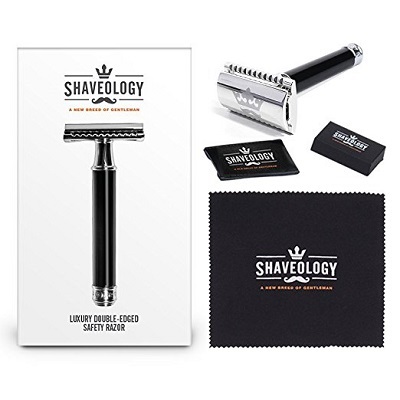 The Shaveology safety razor is a perfect fit for those who want a high-quality shaver that also looks great. It features a beautiful hand-crafted design, non-slip acrylic handle, and chrome plating. 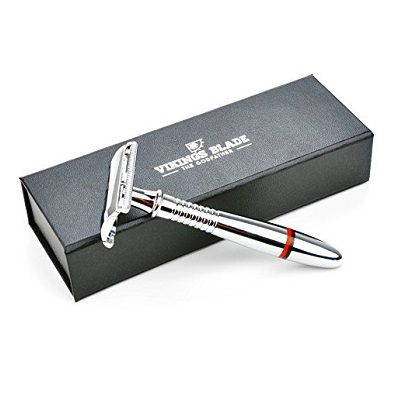 It also comes with five platinum steel razors which will last for about 60 days, a leather blade guard, and a polishing towel, all neatly packed in an elegant and stylish box. It also comes with a 90-day guarantee. 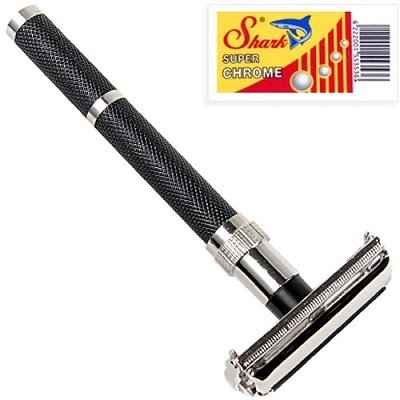 Reviews confirmed this safety razor is reliable, has good maneuverability, and is very well-made and long-lasting. If you are here because you’re after gift ideas, this is the best men’s razor to buy thanks to the design of this product and its packaging. The Wowe razor combines precision cutting power with a beautiful design. 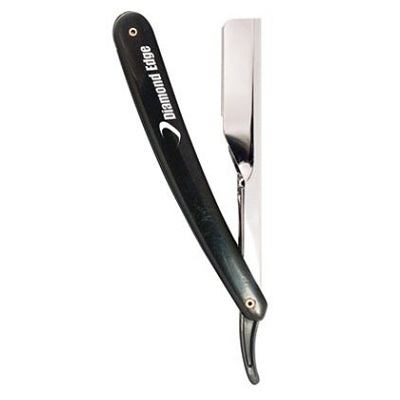 The 4.2-inch handle is the perfect length for reaching all the areas of your neck and sideburns effortlessly. As far as construction materials go, the handle is made from bamboo. Bamboo is a superb choice, due to its natural water repellant properties. It also provides a secure and comfortable grip. As far as cutting ability goes, the blades deliver a very close shave and are 100% stainless steel. The average replacement costs per blade are only 10-30 cents making this a very good budget friendly choice. The Vikings Blade safety razors had to be included in our list of best men’s razors. The beautiful metallic design looks great in any bathroom and is very easy to clean and maintain. Replacing the blades is very quick and easy with the snap system as well. As far as cutting ability, the blades are extremely sharp and suitable for a variety of hair types. The cutting guard makes this a great choice for experienced shavers since it helps to prevent accidental cuts. All of the razors reviewed above are excellent choices. Deciding which one is best depends on things like your budget, experience level, and skin type. A straight razor offers one of the smoothest shaves, but requires more precision and experience to effectively use. A safety razor is more suitable for beginners but is slightly more expensive. The one from Vikings Blade seems the best men’s razor for experienced shavers, but the Wove model will work great for beginners, too. Is there anything you would like to add to this list? Which product would you consider to be the best men’s razor?